In addition, we have a high-end palletizer, bottle air flush, rotary filler, inline filler, sleever, case packer, shrink tunnel, perforator and more, which enable us to produce nearly any cutting-edge RTD beverage. We also offer a broad range of plastic bottle sizes, ranging from 2 ounces up to 64 ounces, to better serve our customers and their product specifications. We do much more than simple beverage bottling at Southeast Bottling & Beverage. In fact, we offer turnkey services to help you develop your ideas from scratch. We are able to take your vision and make it a reality with the help of our research and development teams, procurement division, production staff, and quality control officers. Our bottling facility regularly supplies both bottling services and complete turnkey solutions for liquid supplements, teas, fruit juices, flavored waters, energy drinks, sports nutrition drinks, whey and protein based products, functional beverage and more. 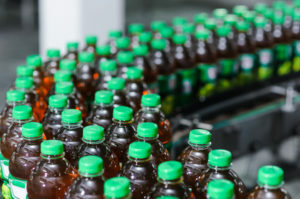 At Southeast Beverage & Bottling, we know beverage production and packaging, and our experienced and knowledgeable staff is 100% committed to helping you and your company put your products on store shelves. We gladly provide trial runs with small quantity requirements for market testing, validation and sample testing, providing our new beverage makers with a low-cost way to get their ideas off the ground. Our bottling facility is able to provide quick turnarounds and ensure that your products meet the strictest of quality control standards. We are proud to support beverage manufacturers in Alabama, Mississippi, Delaware, Virginia, Tennessee and beyond, so contact us today to learn more about our beverage bottling capabilities.